Lacrimosa have always been a controversial band: both loved for their emotional lyrics and epic music and scorned for their dripping pathos and exaggerated dramatic art. "Lichtjahre" surely will not change this. The idea of making a "concert movie" instead of a usual DVD with concert and some backstage stuff sounds promising, but the result is not fully convincing. 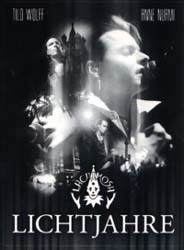 Most of all the concert parts are worth watching, high quality in sound and vision and able to capture the special atmosphere of a Lacrimosa gig. Filmed during their tour for the latest release "Lichtgestalt", the setlist covers 15 years of creativity, including songs like "Copycat", "Alles Lüge", "Durch Nacht und Flut" or the beautiful sung "Not every pain hurts", but excluding the first two releases and their smashhit "Allein zu zweit" from the 2000 sucess "Elodia". The songs are embedded in backstage recordings, which are interesting at the beginning but due to the "another place, same procedere" - scheme start to bore pretty soon. After the fifth repetition of the band leaving the tour bus, walking on stage, leaving for the hotel or doing some sightseeing, it's really enough. Surely the enthusiasm of the fans is understandable, but it quickly crosses the border between interesting statements and just hailing their heroes, especially if it is celebrated for hours. Bands like Nightwish and Dimmu Borgir have shown with their releases that the "less music, more behind the scenes" concept can work, but this "concert movie" misses the real personal moments, to make it unforgettable. And the dialogues. An Interview with Anne Nurmi and Tilo Wolff can only be found under "Specials".